Spring is really here! 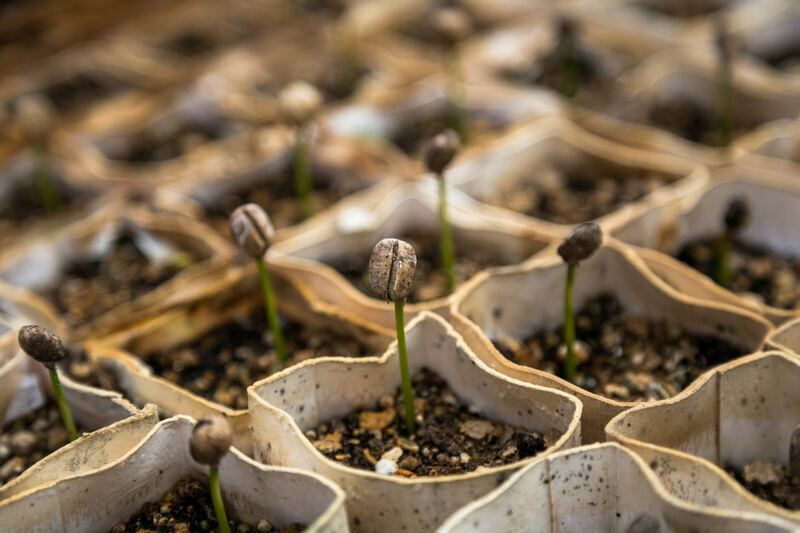 Tulips are coming up, lambs are romping around, my madder plants are emerging showing little red sprouts, rhubarb is coming out of the ground looking like an alien. And, I don’t mean to scare you, but April is National Moth Hatching Month. It’s true. I read it on the internet, along with tips from Textile conservators, the Smithsonian Institution, and Martha Stewart, for preventing, and dealing with wool moths and carpet beetles. For the clothes moth, the larval stage (larvae is the form that eats your fiber) will last between two months (a warm humid climate) and six months (a cool climate). So April isn’t the only month when we worry about these things – but here we are. 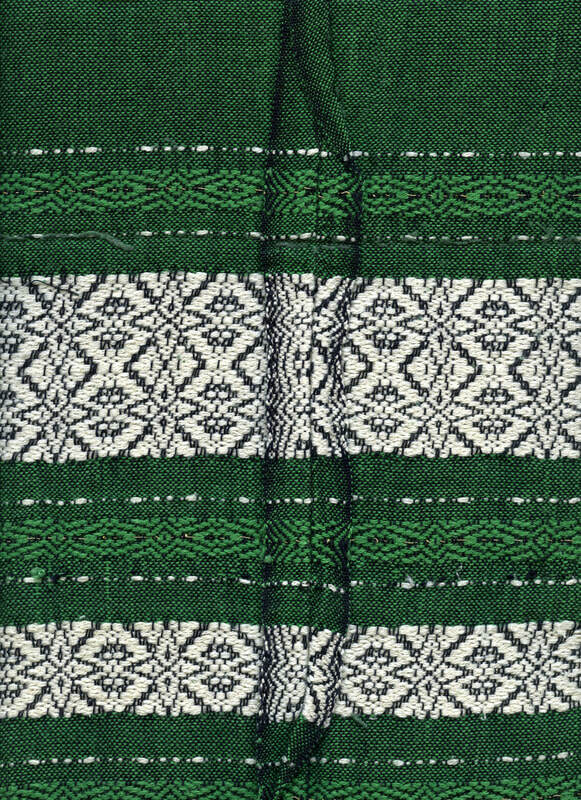 Katherine Larson, Author of “The Woven Coverlets of Norway” is our April speaker. 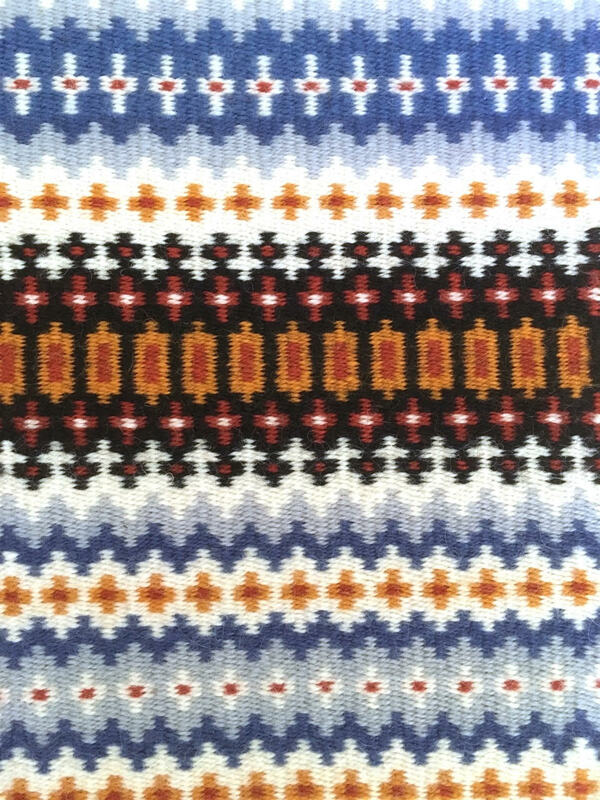 Kay is a faculty member in the UW Department of Scandinavian Studies, a weaver and expert Textile researcher and speaker. Kay will bring two tables worth of samples, along with her slide show. You will not want to miss this program! HAVE YOU PAID YOUR 2019 DUES? The good news is that we have 42 paid members — thank you!! The not-so-good news is that 25 of last year’s members haven’t yet renewed their memberships — if I didn’t catch you at the March meeting, you can send your check to WWG, PO Box 403, Bellingham 98227 (individual, $25; family, $35; student, $20). 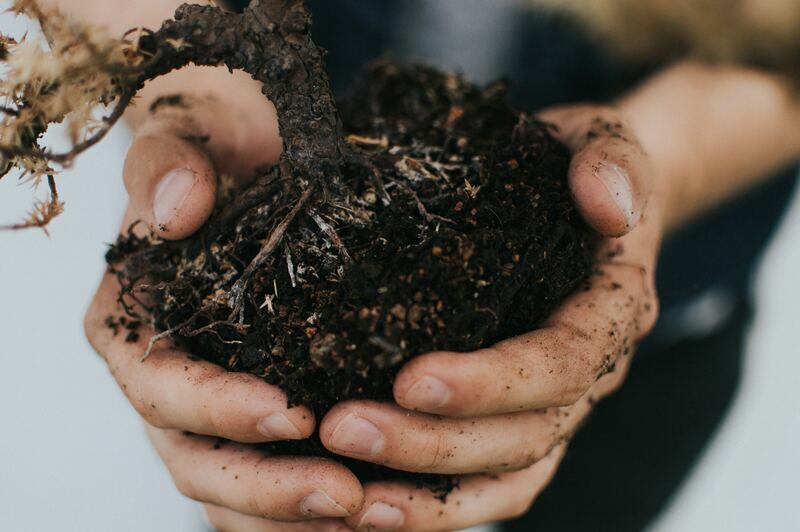 We’ll be cleaning up our e-mail list in April to include only paid members — don’t miss out on news and announcements from the Guild! 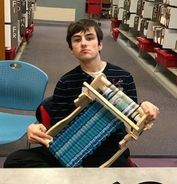 Our program for March Program included member plant-dyed yarns as show and tell, and an inspiring documentary on the re-emerging production of natural Indigo, created by the Maiwa Foundation. 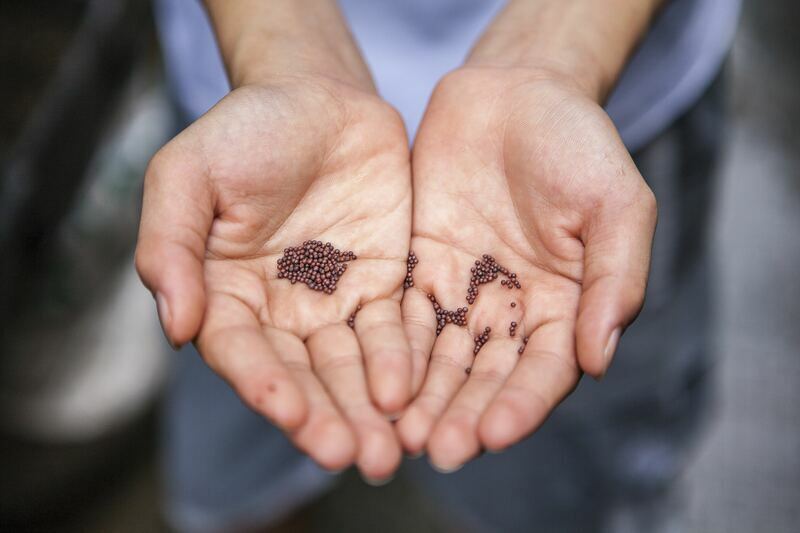 Seeds for Madder (Red), Weld (Yellow) and Japanese Indigo (Blue) were shared. If you want seeds, contact Carol B. there are still plenty. Michelle showed her lovely plant-dyed Fair-Isle knitting project, and Tina’s basket of handspun bulky wool in shades of Indigo blue has us all inspired to decorate with yarn, even if we don’t have a particular project in mind! Note from Chris Paul & Cynthia Poppe: SpiNit won't be meeting at the Jansen Art Center from April through September but plan on starting up again in October. Will keep you posted on that for sure. The Next Drop In will be Sunday, 04/27/19. Please email Kelley if you have questions. 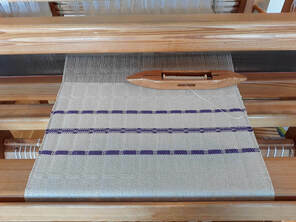 Are you interested in a technique, weave structure, type of loom, particular fiber? 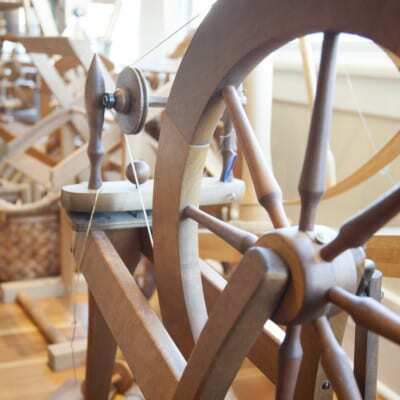 A countermarche loom group is starting, members get together for plant dying and eco-printing; spinners love to spin together, folks are weaving gifts for the Salish Canoe Journey, Sprang is a thing; Small Looms, Inkle, Tablet weaving, finger Weaving, Rigid Heddle… what is your thing? Find a mentor or be a mentor. Shout it out and share the learning, practice and fun. Early Bird Registration continues until April 15th with a great choice of Pre-Conference Workshops and Conference tickets available. We have 24 instructors offering 18 workshops and 76 seminars. Opening & Keynote, Fashion Show, Exhibits, Market Hall, Special Interest Meetings and more. We are offering additional spaces for workshop and seminars by Jane Stafford and workshop by Robyn Spady. Showcase your love, imagination and skills for weaving, spinning and the fiber arts in the Fashion Show, Exhibits and Guild Booths. We invite attendees to interpret the conference theme of Confluences individually or in conjunction to others. We are offering more Guild Booth setup times for those attending Workshops. The Exhibit Categories and Awards has been updated to include several more award categories submitted by Guilds and individuals. There are cash awards for all categories. What’s New has a series of blog posts on Masters of the Craft instructors continues and other information. Volunteer Form is available for those interested in giving us a hand with many of the front line and behind the scenes activities that make an extraordinary conference for the attendees. Check out the updated list of Vendors, more are being added as they confirm attendance. Prince George – Something for Everyone has Where To Stay, What To Eat, Things To Do, Services and more. Fluff and Stuff there will be fiber available to spin and to knit with the end product being a 15 cm or 6 inch knitted square. The squares will be donated to our local Cancer Agency Center of the North to be sewn together as lap blankets for patients to use while receiving treatment. 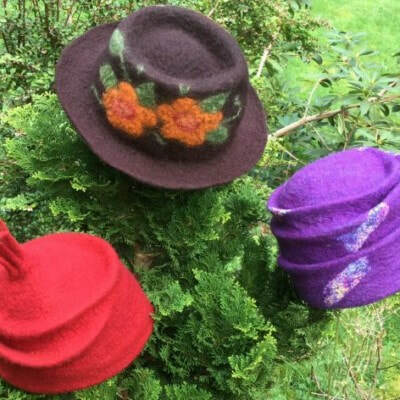 So bring your patterns and knitting needles, some needles will be available. If you wish to donate a knitted square or two you have already completed they can be dropped off while registering. Thank you for supporting our local Cancer Agency. Thank you to all those who have registered and we look forward to seeing you in June. The WWG website will be adding a page especially featuring service and community projects for your reference. Please bring fiber-related service projects to the attention of the guild by making an announcement in a meeting, and sending a note to the WWG board through the website contact page. 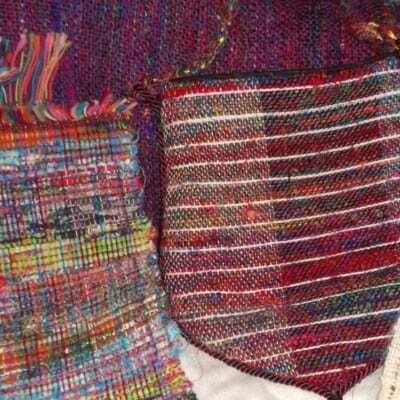 ​Wool and Natural fibers at the NWWA Fairs! Starting in 2019, the Wool show, is more than just wool! Entries into The Wool and Natural Fibers Show, in addition to Wool and natural animal fibers, will now include divisions for Spinning, Weaving, Macrame and Basketry using natural plant fibers such as cotton, linen, hemp, as well as Basketry, using natural plant fibers, including reeds, grasses, wood, cane, bark, etc. 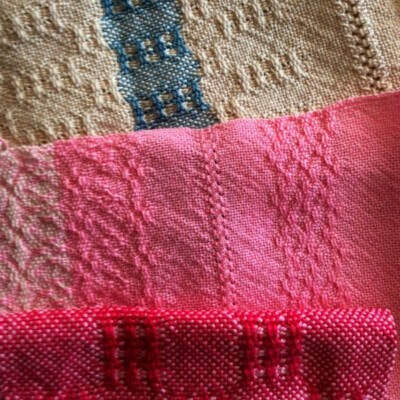 These additions to the natural fiber categories will not replace the existing needlework categories. Knitting, crochet and embroidery will continue to enter in the Needlework Department.The Weavers Guild will create and distribute a “Tip Sheet” to aid in preparing your entries for the Fair, including dates, Categories, Divisions, classes and step-by-step instructions. ​Spend a Day at the Fair! Start thinking about what you might like to demonstrate or help with at the Fair this year. The Rotary building is a lovely and cool place to be in August, with moo-wiches just up the way! 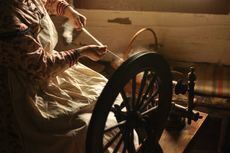 Spinners, weavers, felters, basketmakers, make plans to show your stuff, and help the public learn more about fibers and what we love to make out of them. The Fair is August 12- August 17, 2019. Some help is needed the previous week as well, for taking in entries, set-up, and display. Hope you can be there, it is such fun! 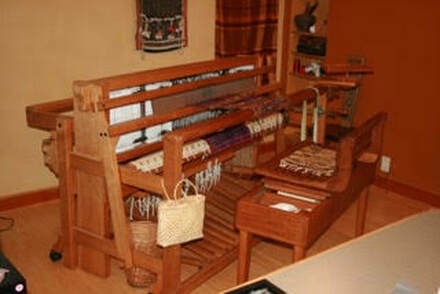 Yes, the big Swedish Loom will be set up again this year. We hope to have a flax spinning demonstration, and chair caning too! It’s easy to drop of your spinning wheel and materials right at the Rotary Building, and Volunteers get free admission to the Fair. 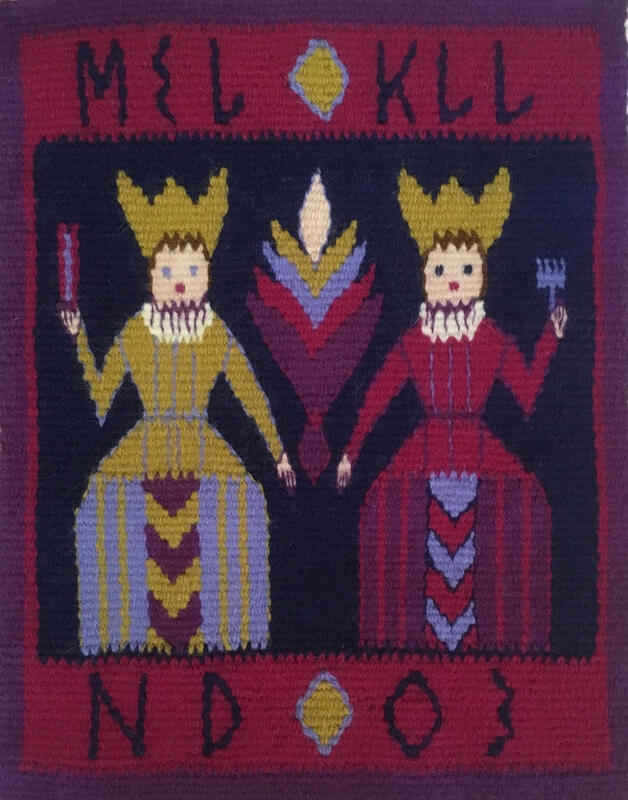 Show and sale for Vida Nueva Women’s Weaving Cooperative. Seaside Gallery LaConner WA Morris and First Street. 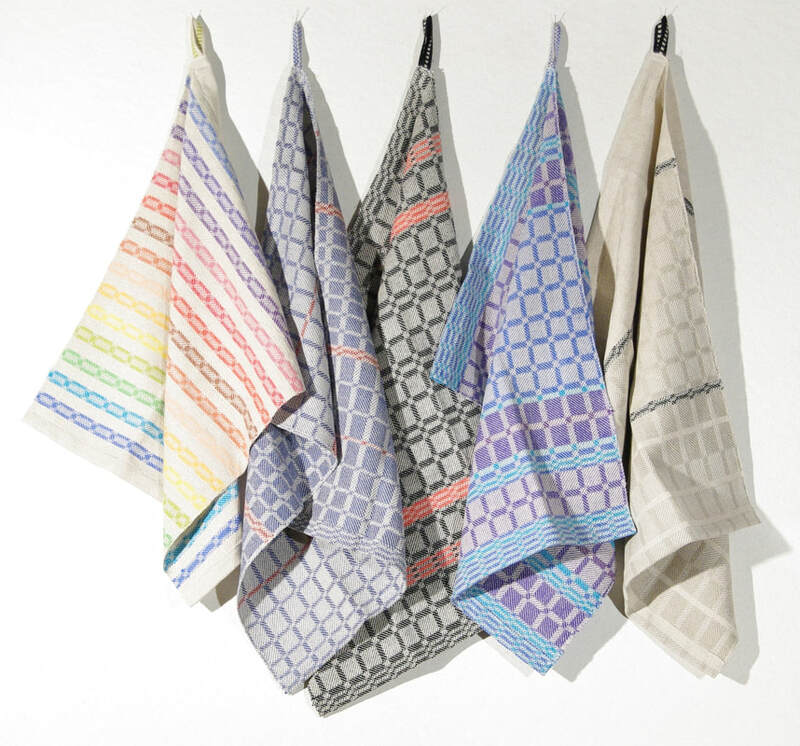 Fine, hand loomed, naturally dyed, wool rugs, bags and table weavings. Large selection of traditional and new designs. 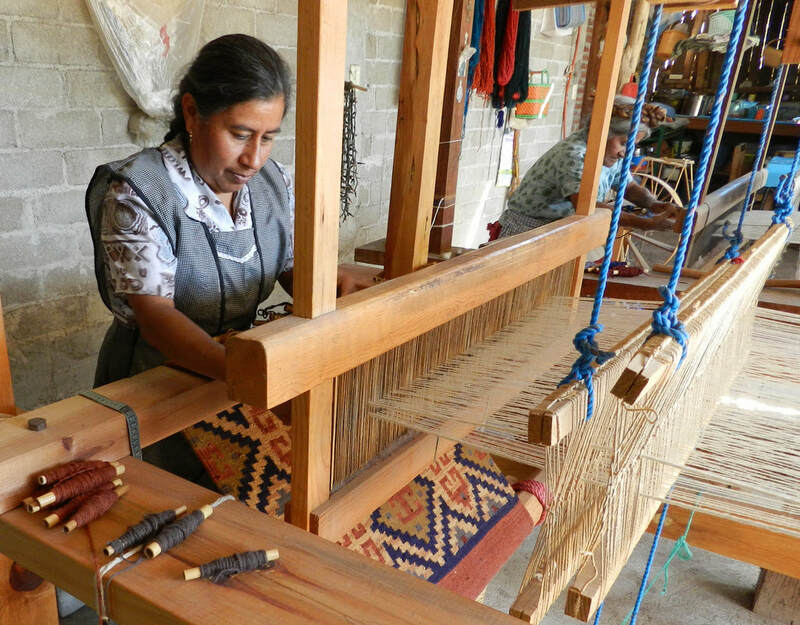 All proceeds support economic and artistic independence and social justice for indigenous women in Oaxaca, Mexico. Includes a $200 donation to the Oaxacan programs we will be visiting. Final payment is due on August 25th. Included: lodging, all in country transportation, guides, entrance fees, cooking class, all breakfasts, three lunches and three dinners, $200 donations to local programs. Excluded: air transportation, meals not included in the program, activities during free time, travelers’ insurance. Oaxacan city tour, including an overview of its history and culture, with stops at the beautiful Santo Dominqo Church and the Santa Domingo Museum. 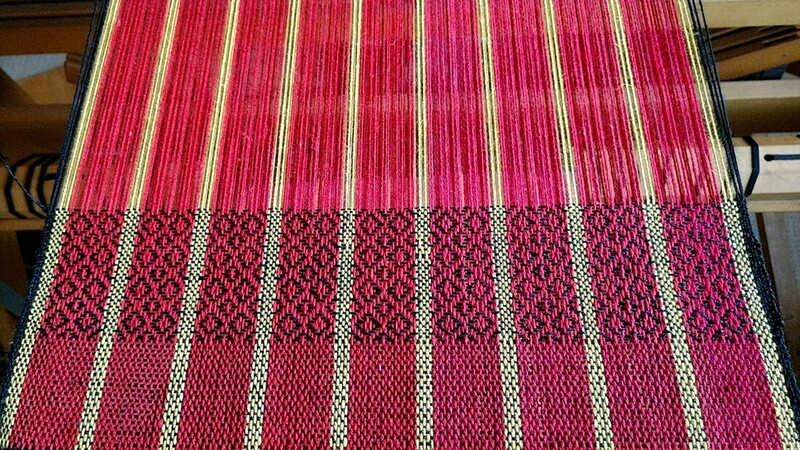 Two days with the women of Vida Nueva, where we will learn about their rug weaving techniques, including the use of natural tints. We will also learn about their activism in their community. ​Observation of the Festival of Rosario, noteworthy for its traditional dance and parade. Day trip to CEDICAM (Centro Educativo Desarrollo Integral Campesinos Alta Mixteco) to learn about their women’s greenhouse program, farm tour and overview of sustainable farming strategies. Cooking class with Chef Gerardo Aldeco Pinelo at La Cocina Oaxaqueña will feature an early morning market visit to select fresh food for the day’s preparations and will include instructions on making Oaxacan's world famous moles. Visit to the ruins of Monte Alban. Daytrip to village of San Martin Tilcajete to visit the studios of Alejbrije artists.